Pay it forward... click on any picture or headline to go to PayPal. Consider a monthly gift; it's easy to spread out your gift to make it easier on your budget. Thank you ever so much for donating to us, so we can help the next ones! 100% of your donation goes to help the hounds because we are an all-volunteer organization. 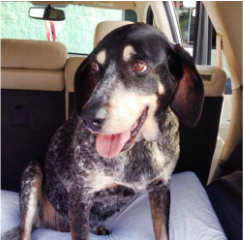 Bonnie Blue, an 8-year-old Bluetick Coonhound, arrived at Animal Control Cherokee County, Georgia, needing serious dental work including extractions. Bonnie was quickly rescued by the Carolina Coonhound Rescue. 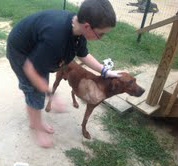 She received the necessary treatment with the help of a $50 contribution from the Long Ears Alive! fund, a program from Coonhound and Foxhound Companions, and she has since been adopted. Hounds often arrive at shelters needing dental treatment. We appreciate any donations toward recovering our costs for Bonnie so we can help the next one. Jessie, a young lemon and white foxhound, was rescued from the local shelter by Ruff Times Rescue in Clermont, Florida. She had two broken bones in her leg, was in terrible pain, and had surgery at significant cost. She is now in a home complete with a pack of two boys and where she is thriving and her beauty restored. They renamed her Honey! This is the sort of good news we all hope for. If you can make a contribution of any amount to help us recover our $50 donation for helping Honey, it will be greatly appreciated by both us and the next hound getting much-needed medical treatment. Many thanks. Trixie, a young Treeing Walker Coonhound, arrived at the Pendleton County, Kentucky, animal shelter emaciated, weighing only 28 lbs., and with injuries to her paw and pelvis. She healed and finally reached her normal weight in the loving care of her foster family. She is staying at Cause for Paws in Columbus, Ohio, until she finds a home. Long Ears Alive! contributed funds toward the treatment of her paw injury and hopes to continue making such donations with your help. Any amount is appreciated. Many thanks. Four young female Treeing Walker Coonhounds were dropped at the Darlington County (South Carolina) shelter, all heartworm-positive. Dubbed Maya, Marilyn, Michelle, and Mariella, they have all completed successful treatment for heartworm, paid for in part with $200 of Long Ears Alive! funds. As of mid-April 2014, Michelle is in foster care, and Maya and Marilyn are in the care of rescue groups, and Mariella has found a home! Treatment saved their lives. We need your help replacing the LEA funds we spent on these hounds’ treatment so we can assist yet other long-eared dogs in getting back to full health. A young hound mix, Bella was dropped off at Bladen County, North Carolina Animal Shelter suffering from severe neglect and horrible skin infections and sores and serious flea infestation. She was rescued by Louie’s Legacy Animal Rescue in Cincinnati, Ohio, and has required months of foster care to gain weight, undergo heartworm treatment, and fully regain her health. Bella’s new family adopted her at one of the rescue’s adoption events and she very quickly made herself at home. This sweet dog came back from being in horrible condition. Please donate to Long Ears Alive! so we can help the next coonhound or foxhound in similar straits. Thank you. Cooper (formerly named Rusty), a Redbone coonhound, was found by Burke County, Georgia, Animal Control with a gunshot wound to one of his front legs which was “hanging” and “very swollen” according to the officer. He was rescued by Samantha Holton of Girard Rescue Lifesaver in the neighboring county and underwent surgery to amputate the leg. Long Ears Alive! contributed $75 toward its cost. Rusty spent some time in temporary foster care and became best friends with the foster’s 4-year-old son. He was then adopted and lives the good life in Montreal, Canada, and is now called Cooper. He resides with his human and two other rescues with whom he shares a bed – a golden retriever and their black & white kitty. Life is NOW good. Clarence is a Treeing Walker Coonhound rescued from the Coweta County, Georgia Animal Shelter and he is still available for adoption (as of late February 2014) from the Divine Destiny Rescue in Pennsylvania. Coonhound and Foxhound Companions provided $75 toward the cost of Clarence’s heartworm treatment. Please help us replenish the "Long Ears Alive!" funds we invested so we can help another hound. Lucy Loo is a Treeing Walker Coonhound mix, about 2 years old. Lucy was rescued from the Beaufort County, North Carolina shelter by Rural Dog Rescue in Washington, DC. Coonhound and Foxhound Companions has donated $50 toward the cost of her heartworm treatment and having a growth removed from her foot. Please help us recoup our $50 donation toward helping Lucy get better so we can assist the next hound needing help. We all thank you. The Coonhound Companions team thanks you for every dollar!